Is the 3 Day Refresh Another Juice Fast or Cleanse? No, it’s not. Many juice fasts or cleanses are high in sugar and low in protein, which can leave you weak and sluggish. One of the reasons that makes the 3 Day Refresh work where cleanses don’t, is that it flips that equation and is high in protein, and low in sugar. Also, the sugar you do get in those three days is in the form of whole fruits, where you’re also getting the natural fiber as opposed to straight liquid sugar. 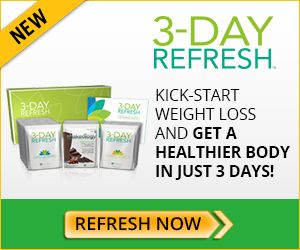 The 3 Day Refresh supports your metabolism with easy to prepare, nutritious food. How Does The 3 Day Refresh Work? Along with proteins you might expect, like flax and chia (pause for my 90’s babies to sing cha-cha-cha-Chia! ), and quinoa, Shakeology also includes the fun-to-say Sacha Inchi – a plant native to Peru, that dries on the vine for two whole years before it’s harvested. Talk about needing patience to produce a great product! Most of us know that a protein blend helps curb cravings and keep you fuller longer, but did you know that it’s also great for your hair and nails? Among these great ingredients, you’ll find the darlings of health gurus – acai, goji berries, and green tea. Names you may be less familiar with – the Chinese fruit Luo Han Guo (which is about 300 times sweeter than sugar in its purest form, and yet low enough in calories that it’s part of Chinese doctors’ treatment plans for obesity and diabetes! ), and Camu-Camu, another Peruvian plant that is high in Vitamin C.
Along with making your shake super delicious, these fruits support a healthy heart and optimal blood pressure. These plants are my only exception to the “if you can’t pronounce it, don’t eat it” rule – I just don’t have the linguistic background to read out this world tour of healthy plants without butchering their names! I’m not even going to try, sorry. But just try saying “Ashwagandha” with a properly dramatic flair and tell me it doesn’t make you giggle! This is the blend to pay attention to if you’re under a lot of stress (aren’t we all), because it’s main job is to protect you from the effects and balance your endocrine system – you know, those little gremlins that release the stress hormones that sew all your clothes a little tighter every night. What’s a health drink without a little kale and spinach? Yup, that’s in there too. Along with the Himalayan Moringa, also known by its adorable local name of “drumstick tree,” Yacon root, also known as the “Peruvian ground apple,” and chicory root, these blends round out the Shakeology superfood roster. All together, these ingredients help alkalinize the body, increase nutrient absorption, and improve your digestion. Pysillium husk is sometimes used to treat irritable bowel syndrome, and is a great source of fiber for people who are limiting their carbohydrate intake. It’s a soluble fiber, so it helps fill you up and curb your appetite while also improving your digestion. So They Just Throw Everything Into A Bag And Hope It Works? Not exactly. The blends used in Shakeology in Shakeology in particular are carefully crafted and sourced in their purest forms throughout the world. The co-creator of Shakeology, Darin Olien (who is right at the top of my preemie role models list for my little boy!) is absolutely fanatical about research, testing, sourcing, and formulation. He works with a full Scientific Advisory Board at Beachbody to make sure that it’s not just right the first time, but that all of the ingredients continue to meet the standards set when they were first included. I may not be a nutritional expert, but I’m really particular about what I eat and the companies that produce what I feed to my family. I have so much faith in Darin and his team of experts that I share my daily Shakeology with my son, and you can’t ask for a higher vote of confidence than that from me. If you’re still wondering, “Does the 3 Day Refresh work?” don’t forget that you have 30 full days to return it for 100% of your money back. That’s more than enough time to not take my word for it, buy the 3 Day Refresh and try it for yourself! Want to know more about what’s in the 3 Day Refresh shakes? Head over to the Beachbody site and click on the “Supplement Facts” links!